Name of Shopify store holds a significant place in order to make your Shopify store successful. It is also one of the primary brand elements and a top most factor contributing to your store from SEO perspective. It must be chosen with lot of care and follow following best practices before naming your Shopify store. Text as a Shopify Store Name – This will be utilized when the Shopify store is based on Typography (Text) and doesn’t have the Image base store name. Shopify provides an intuitive interface for utilizing both the both mentioned methods of naming the Shopify store. 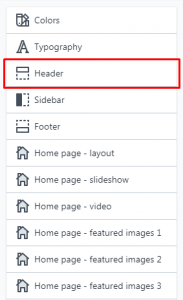 Navigate to Theme section in the Online Store in Shopify store admin panel. Once you have uploaded a Theme successfully to your Shopify store, then click Customize in the Current Theme section to add the Image or Brand logo in your Shopify store. Upload your Custom logo (450 x 200px) by choosing file. 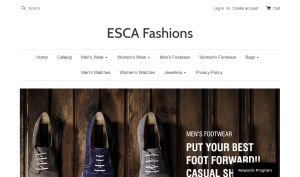 Check the checkbox “Main Menu below logo” in case if you need your brand logo above your menu as given in the ESCA Fashions store example in the Text as a Shopify store name section above. You have successfully added an image as a Shopify store! It is recommended to utilize Text based method for both scenarios from Search engine perspective. Before finalizing your Shopify Store name, check out 6 best practices given by Shopify on how to find that killer name. For ease of searching business names, Shopify provide a tool for generating business names. Click here to use the same. Use Store Name on all the Page Titles as a suffix to gain an added advantage in SEO.